Myrtle Beach, the crown jewel of the Grand Strand, sits at the center of a 60 mile crescent of beautiful beaches. 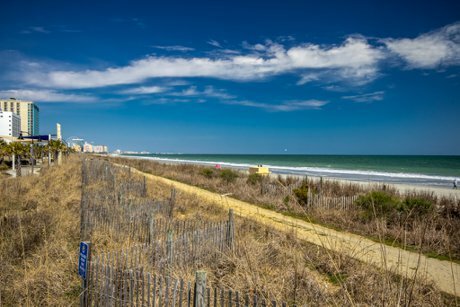 For years, the area's tranquil qualities have drawn tourists from all over the world and have made Myrtle Beach one of the top retirement destinations in the country. Today, Myrtle Beach, South Carolina is the 2nd fastest growing metropolitan area in the United States. Residents enjoy mild climates, beautiful beaches and friendly people. Recreation in Myrtle Beach is serious business. Probably known best for golf, it features well over 100 golf courses, many of which were designed by some of the top designers in the country. The area features many other attractions to choose from including hundreds of restaurants, great shopping, miniature golf, fishing, water sports, and more. Live entertainment and shows can be found at a number of venues including The Carolina Opry, The Palace Theatre, Pirates Voyage® (a Dolly Parton Company), and Medieval Times. Also, with the recent addition of several live music venues, residents and visitors alike are treated to performances by some of the top artists in the country. Myrtle Beach is the home of Broadway At The Beach, a huge entertainment complex with nightlife, dining, family entertainment, shopping, accommodations, and more. 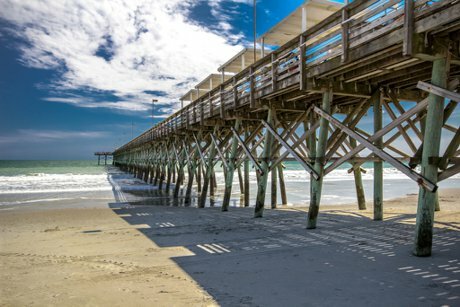 In addition to bringing summer vacationers, Myrtle Beach is home to several annual events which bring repeat visitors, including the Can-Am Days Festival, the Myrtle Beach Marathon, and the Spring and Fall Harley Davidson Rallies. Come see why Myrtle Beach has earned the title of the #1 Family Beach in America! Myrtle Beach Real Estate offers more than enough options for anybody looking to buy a property. Whether you are relocating, retiring, looking for a vacation home or investment, Myrtle Beach has a property for you. You can find oceanfront homes, Intracoastal Waterway, and golf course homes and condos. Luxury homes and condos can be found in prestigious developments like Grande Dunes. Market Common and Withers Preserve feature upscale shopping as well as homes and townhomes on the old Air Force Base. Carolina Forest real estate offers a number of family friendly neighborhoods that feature top notch schools and convenient shopping and dining opportunities. New developments offer pre-construction pricing and 55+ communities are becoming more prevalent up and down the Grand Strand. Vacant land and commercial properties are abundant in the Myrtle Beach area. No matter what type of real estate opportunity you are looking for, Myrtle Beach has it. For additional information about Myrtle Beach real estate, selling a home or condo in Myrtle Beach, or Myrtle Beach homes or condos for sale contact us today! 843-424-6900 or email us.